Rice is one of the most important crops for global food security, and 90% – or about 140 million hectares – of the world’s rice-growing area is in Asia. Rice production and hence millions of rice smallholder farmers are regularly exposed to the risk of damage from drought, flooding, and tropical storms. Timely and accurate information on rice, i.e., crop area, crop growth, and losses due to calamities) is thus very important to rice-growing and -consuming nations. Governments traditionally assist their farmers when a catastrophe has led to massive yield losses which threaten sufficient food supply. Disaster relief remains a strain on national budgets and is often impedimental for developing more sustainable solutions to handle the risks. Consequently, governments seek tools to transfer their fiscal risks resulting from natural catastrophes to cope with the financial burden and the negative impact on its smallholding constituency. Increase the information on rice growth areas and expected yields to help governments, agricultural intermediaries and relief organisations in better managing domestic rice production and distribution during the normal growing cycle as well as after natural catastrophes struck. Provide access to insurance solutions for governments, agricultural intermediaries (such as cooperatives or rural banks) and individual rural farmers to cushion the financial effects on farmers that stem from natural catastrophes such as flood and drought. 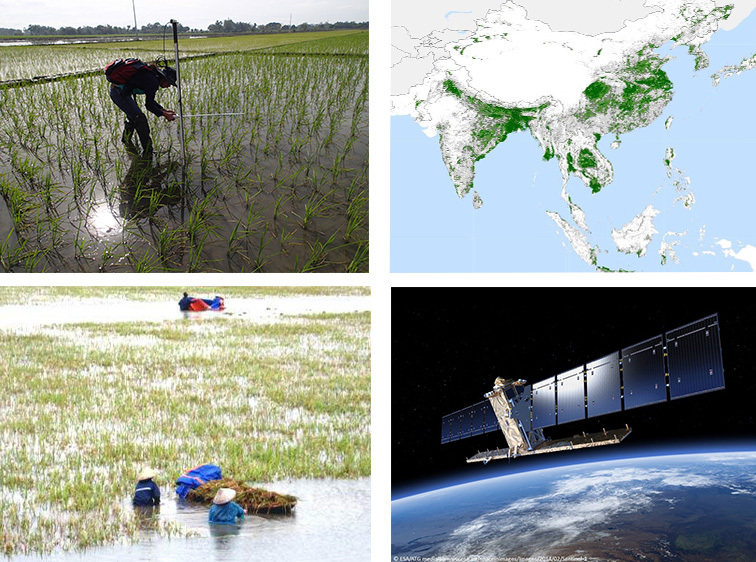 The RIICE project focuses on rice-growing areas in five Asian target countries, namely, Cambodia, India, Indonesia, Thailand and Vietnam. RIICE is implemented through a public-private-partnership between the Deutsche Gesellschaft für Internationale Zusammenarbeit (GIZ) GmbH, the Swiss Agency for Development and Cooperation (SDC), the International Rice Research Institute (IRRI), Sarmap and SwissRe. GIZ hosts the project management office and engages in policy dialogues in India and Thailand, SDC is the main funder of the project and engages in policy dialogues in Cambodia in Vietnam, IRRI and Sarmap are the prime technology contributors, SwissRe contributes with managerial and insurance product development capacities to RIICE.